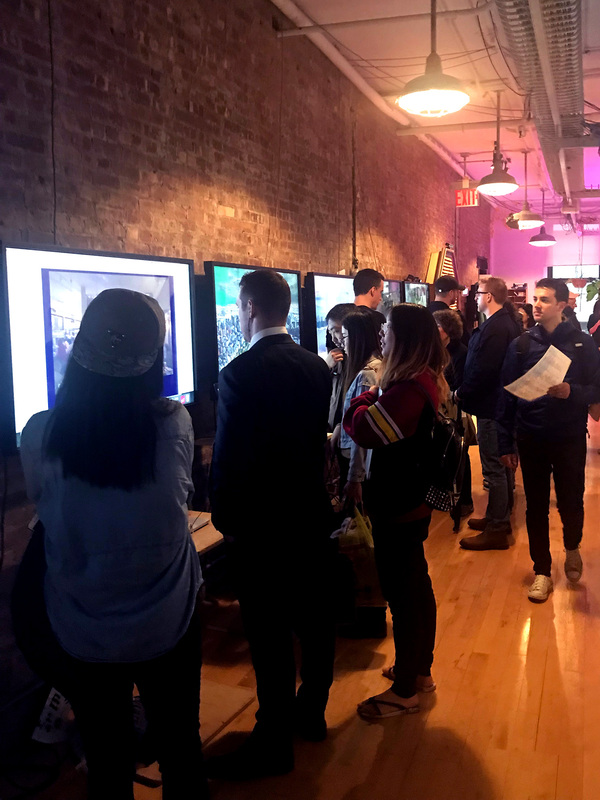 An entire floor dedicated to artistic expression, technological advancement, and social commentary was open to the public on Tuesday, May 15 and Wednesday, May 16, when the NYU Tisch School of the Arts hosted their bi-annual Interactive Telecommunications Program (ITP) show. The event marks the end of every semester and offers ITP students the opportunity to present their completed works. This article describes some of the 84 fascinating projects featured this year. Created by first-year student Hau Yuan, “Consciousness Transplant” is an immersive, virtual reality (VR) experience, that enables users “to visualize your consciousness.” Yuan achieves this by having the user wear a VR headset and sit in a wheelchair, strapped in, to mimic the scene featured in the virtual environment and “balance the whole experience…using those discomforts to increase the tension …[and] concentrate on the user.” The video begins with a first-person perspective of someone being held in a lab, with patients lying on tables and surgically-masked doctors milling about the room. The scene then fades to a colorful, galaxy-like, seemingly endless space before returning to the lab, where the patients, including your first-person avatar, have been turned into robots. Yuan explained that the three-minute attraction was inspired by an episode of the show Black Mirror, “about extracting one’s consciousness and putting it onto a device.” This abbreviated version gave Yuan the chance to work with what he called “immersive media and technology mediums,” such as augmented reality (AR) and VR, which is what originally drew him to ITP. 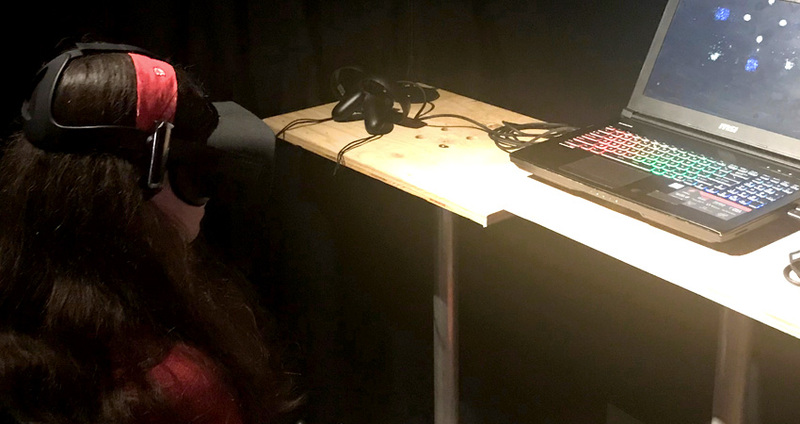 Yuqiao Qin’s “Vuja De” is another project that uses virtual reality technology to focus on users’ breathing, which is sensed through the headset. This three-minute VR scene consists of dream-like sequences that respond to users’ inhalations and exhalations. The interaction between the real-life user and the virtual world experience is what Qin hopes will create a connection between the virtual world and reality. As the sequence continues, Qin hopes users will be able to connect the changing scenes to their own personal realities. 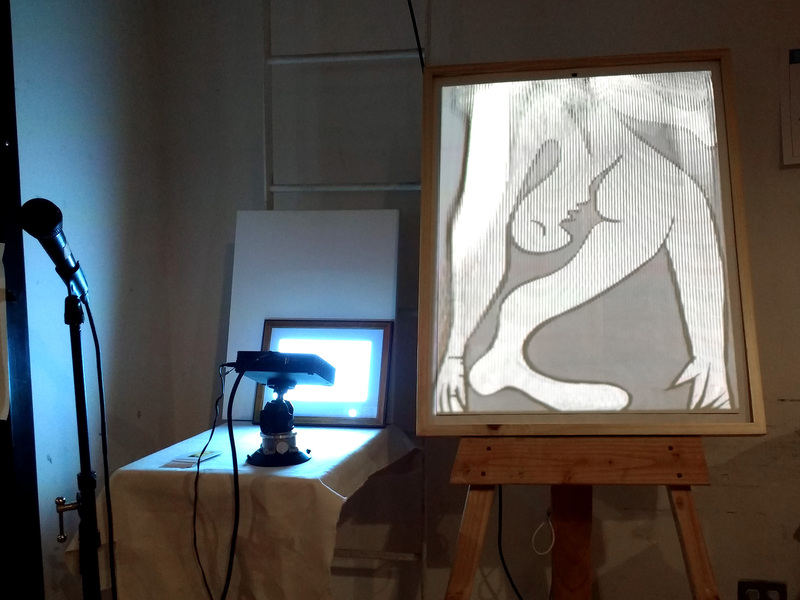 An artistic piece enhanced by technology is Lu Wang’s “Picasso in 2018.” This project changes the nature of visual art by combining it with technology to make it interactive, which Wang describes as “address[ing]…our connection between artworks and the computer age.” “Picasso in 2018” features a projection of one of Picasso’s works that can be altered and twisted by a viewer’s physical movements. A second projection of the same Picasso piece reacts when the user speaks into a microphone. Wang was inspired by her experience as a composer and her observation of the way technology and the internet have changed consumers’ appreciation for artwork. She feels interactive art such as “Picasso in 2018” could reinvigorate public interest in visiting museums and galleries, and encourage people to appreciate art in a physical space rather than just viewing it online. 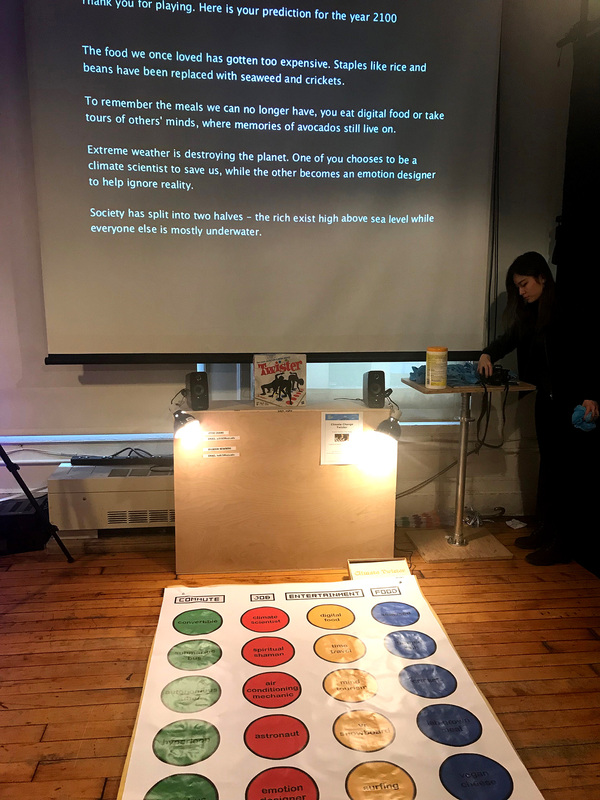 While Wang’s piece attempts to change the way tech-savvy society views art, Jiyao Zhang and Brandon Newberg’s “Climate Change Twister” calls attention to the decreasing health of the planet through an interesting spin on the classic game, Twister. This ecologically-minded version asks users to respond to a series of questions related to environmental conditions and their societal and economic impact in the year 2100. At the end of the game, the players’ answers are used to describe a hypothetical vision of the future—one that looks grim and highlights the urgency of today’s highly-discussed issues. Zhang and Newberg have taken a game that has been popular for decades and reinvigorated it with their main message: that climate change is primarily the result of human activities that will significantly change life on Earth. For example, one completed game predicted that seaweed and crickets would become common food staples, and the rich would live high above rising sea levels that would eventually overwhelm the rest of the drowning planet. 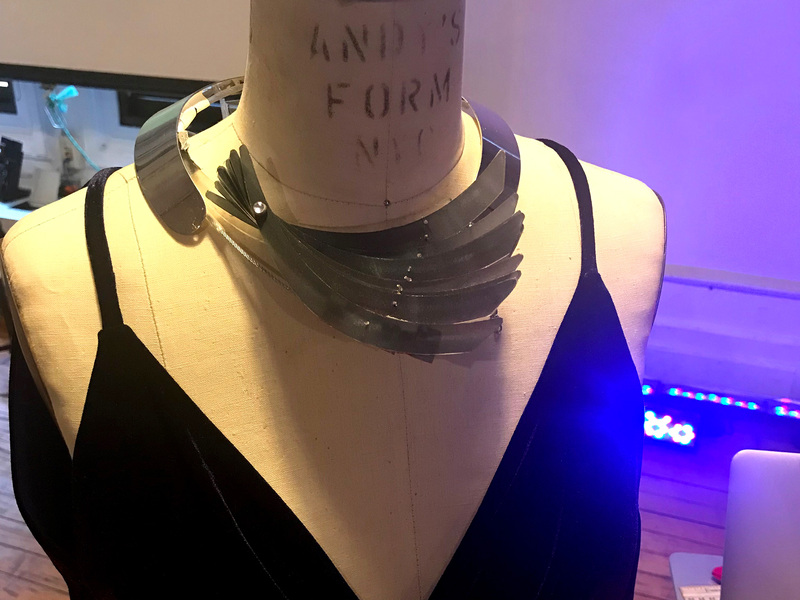 Ridwan Madon’s “Mimossa” features a new kind of wearable technology: a necklace that protects one from unwelcome and unsettling stares. The necklace, when collapsed, looks like a trendy moon-shaped piece of metal. It has a neutral coloring and style, making it suitable for everyday wear. If the wearer were to feel uncomfortable because of unwanted glances or stares at her decolletage and bust, she could activate “Mimossa” using her phone via Bluetooth. This causes the moon-shaped metal pieces to fan out into a new body-shielding shape resembling a feather, protecting the wearer from unwanted attention. “Polyembodiment” employs virtual reality technology and an accompanying short film to allow users to feel as though they are inhabiting multiple bodies. Originally called “Snap VR,” the creator’s preliminary plan was to develop a sort of virtual reality social media in which a person’s followers could experience what the person had, rather than just viewing a video. Creator Will Hallett explained that at first, his idea was to create a sense of experiencing instead of watching someone’s Snapchat of the grocery store. As Hallett worked on his project, his idea evolved into what he called “VR embodiment,” which facilitates empathy through a virtual environment that allows one to feel as if they are walking in another person’s shoes. Hallett considers empathy to be something people practice, rather than something that we have. He hopes to deconstruct the commonly-held notion that others have to “pull themselves up by their bootstraps,” without really knowing that person’s journey. Through his project, Hallett hopes to provide users with a more considerate understanding of the world through shared user experiences. With the help of cameras set up in various corners of Tisch’s fourth floor, “Panopticon,” by Barak Chamo and Tong Wu recreated Foucault’s panopticon, a theoretical prison in which the guards stand on the inside of a lit column while the prisoners reside outside it, unable to determine if they are being watched. Users stand in front of a half-dome-shaped set of honeycomb-style screens, beneath a spotlight and facing a camera. 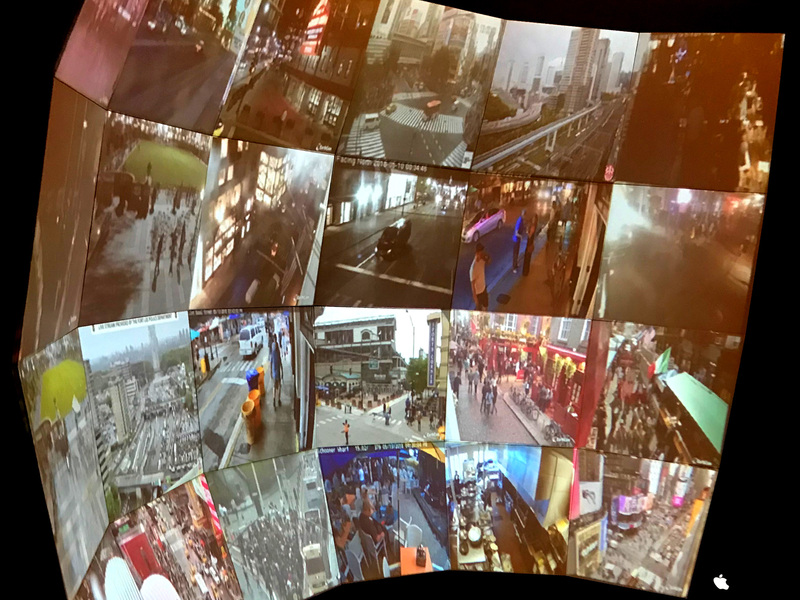 Before being activated, the screens show CCTV camera footage of various cities around the world, with cars and people moving from place to place, oblivious to the fact that they are being recorded. Once a user steps under the spotlight, the camera picks up their face and the images on the screen change to multiple photos of that person’s face captured throughout the ITP event. This project makes tangible the concept that we are living in a panopticon of surveillance, one in which many people follow laws and obey rules based on the knowledge of being watched and the fear of being caught. The shape of the screen mirrors Foucault’s round panopticon. The spotlight and camera give physical representation to the state of 24-hour surveillance we live in, but often forget, and the unexpected evidence of having been watched throughout the ITP event deepens the impact of Chamo and Wu’s project. 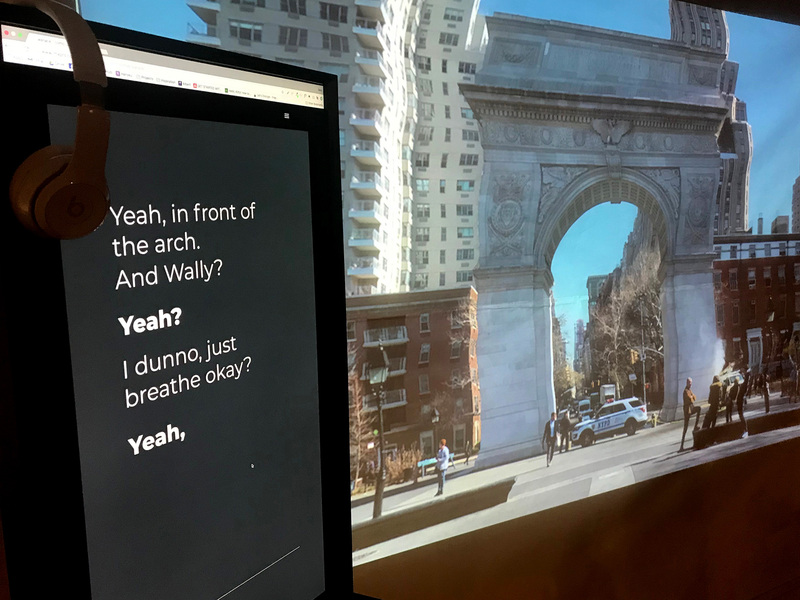 “1968 Washington Square Park” is a story-motivated augmented reality that teaches the user about the historical moments of 1968 through a tale of two characters and the use of geolocation. This AR app, which will be available for download from the App Store in July 2018, allows users to participate in the story of Wallace and Jim as they discuss Wallace’s draft notice for the Vietnam War. Using archival footage from Bobst Library, Ilana Bonder created “1968 Washington Square Park” in a joint effort with NYC Media Lab and A&E Networks’ History Channel. Bonder described her app as an answer to questions such as, “Who has also walked here?” and “What happened in this specific space?” The app reveals new historical facts as you move around the park and allows you to participate as either character, depending on your geolocation. This year’s ITP show was a particularly nostalgic and memorable one since the ITP graduate program and a new undergraduate Interactive Media Arts (IMA) program will be moving from its longtime home at 721 Broadway (where the program was founded by Red Burns in 1979) to 370 Jay Street in Brooklyn during summer 2019. The IMA Bachelor of Fine Arts undergrad degree program is welcoming its first students in fall 2018 with the goal of educating students to invent the future by teaching them computation, an essential creative capability. The ITP goal of inspiring minds through advancing interactive technology succeeds every year. Follow their Twitter account for information about upcoming shows and other ITP-related news and events. Learn more about these and other projects at the Spring 2018 Show, and in this video.